Selkirk RFC team manager Tom Ramage believes the Philiphaugh side can pose a potent challenge for promotion in 2017-18, after a season of rebuilding. 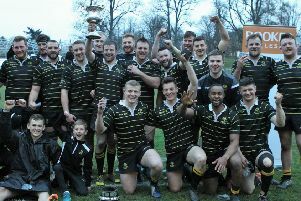 The Souters managed a top-half finish in BT National League Division I last term but Ramage said the campaign – which followed relegation in 2015-16 – was intended as a period of taking stock and trying to construct a new side, rather than aiming for an instant BT Premiership return. However, the search had been under way already for seven or eight weeks for some new players and he believed “very much” that Selkirk could be worthy challengers for a trip back upstairs. “Everybody we played this year (in the league) we beat, apart from Marr,” he pointed out. Selkirk were quite capable of going back up again but “it’s a hard league to play in,” added Ramage. “We want to get a couple of lads regarding beefing up the pack and to bring some more pace into the back line,” he said. Next season’s League I will have a heavy Borders presence. In addition to Selkirk and Jed-Forest, who made a strong bid for promotion themselves last season, relegated Gala and newly-promoted Kelso will also be part of the mix.